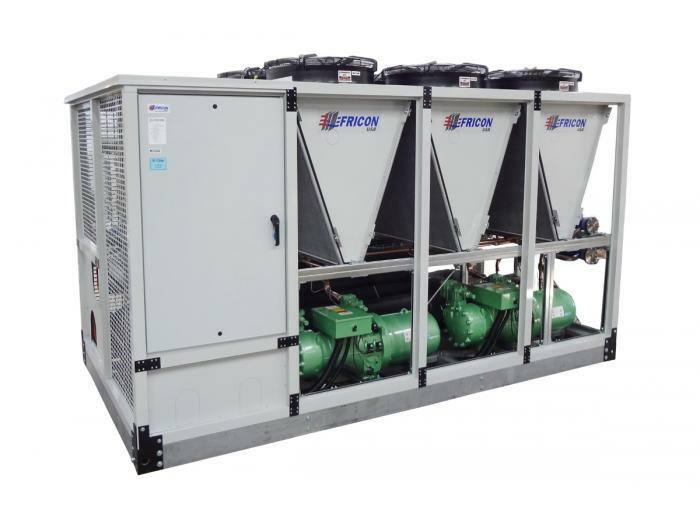 The new FLCH-7P: FriconUSA Large-Sized Modular Chiller, 7 Series Premium, air cooled condenser, is designed to meet most of the demands of medium to large range capacity for process cooling. Its flexible innovative design allows the modules to work independently in capacities between 70 to186 TR or grouped in different combinations of sizes to form one or various sets and meet capacity requirements up to 744 TR per set. The quality, high efficiency up to 11.8 EER and exceptional IPLV, according to AHRI Standard 550/590, ensures our customers reliability, low operating cost and long life of the equipment. We have two types of Chillers depending on the application for high temperature and medium-low temperature for use with glycol. The most common applications are for cooling in industrial processes such as: plastic plants (molds, extrusion and blowing), chemical processes, beverage industry, glycol cooling systems, ice rinks, thermal ice energy storage, petroleum and for demanding air conditioning for industrial plants or data center. Extended ambient operating temperature range: +125°F (+51.7°C) to -20°F (-28.9°C)**See optional packages. Bitzer compact screw compressor(s) with one or two separate refrigeration circuits for more reliability. Automatic step-less unloader, adjusts the compressor capacity to the required thermal load between 25%≃100% for one compressor and 13%≃100% for dual compressors, per unit. Innovative modular design, aluminum frame with galvanized steel reinforcement, high efficiency condenser with strong structure and aluminum micro-channel coil, less weight and size; reduces transport, assembly and construction costs. Built-in 8” Victaulic connection manifold to easily join units and create a set, simplifying installation. Eco-friendly; Micro-channel Air cooled condenser coil with reduced internal volume requires, along with the incorporated refrigerant distributor in our innovative, high-efficiency, Direct Expansion (DX) shell-tube evaporator, reduces the refrigerant charge between 60% to 70% compared to Chillers from similar efficiency with flooded evaporator. Wide range of applications for water or glycol. Built-in high efficiency, shell-tube, single pass, counter-flow, Direct Expansion (DX) evaporator with efficiency similar to a flooded evaporator but with less refrigerant charge. Electronic expansion valve, liquid sight glass and solenoid valve.